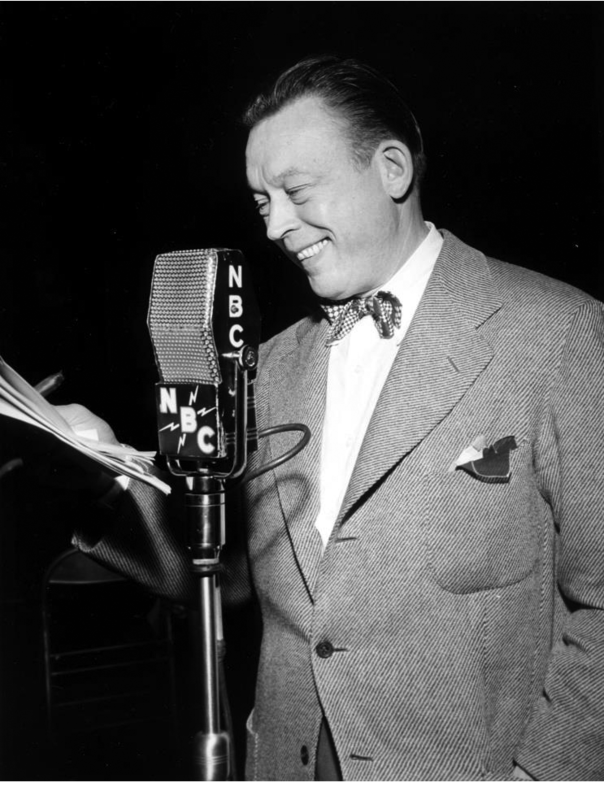 "They Almost Junked the Junket"
Fred Allen worked his way to radio fame from a New England upbringing that seemed to predestine his eloquent wit. His father was a amusing storyteller who worked at the craft of bookbinding. Intelligent sharp witted humor seemed to run in the family. Fred wanted to be on the stage from an early age. Getting started as a juggler, by the early 1920's Fred was on the road, and began performing in New York City. His big break came when he appeared on Broadway in The Passing Show in 1922. In this show, he met the lovely Miss Portland Hoffa, who he asked to become his wife and radio partner (ala Burns and Allen). Together they developed a wonderful give and take rapport, with Portland serving up the bubbly straight lines for Fred's witty rejoinders. They got on the radio in 1932 with a show called, improbably, "The Lintit Bath Club Revue." Other shows followed quickly, including The Salad Bowl Revue (1933), The Sal Hepatica Revue (1933-34) and The Hour of Smiles (1934-35). One of the featured segments in the early years was a segment where amateurs came up to do their bit, harkening back to the days of regional vaudeville itself when Amateur Night was a staple of the local theatre. Text on OTRCAT.com 2001-2010 OTRCAT INC All Rights Reserved-Reproduction is prohibited. 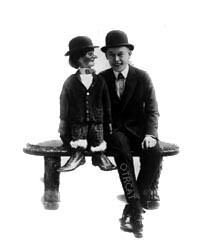 Fred Allen with dummy circa 1916Allen's comedy was almost always topical and satiric, and throughout his career he was famed for being as sharp with the quip as any live radio comedian. He wrote most of his own stuff, loved to comment on the daily foibles of the day, his sponsors, and the world of entertainment. In the New England spirit, he saw his show as something of a town hall gathering, and hit upon the name "Town Hall Tonight" as the show from 1934-39. 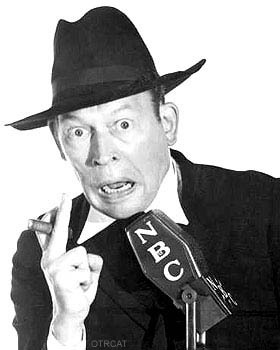 Among Fred Allen's greatest admirers was Jack Benny, with whom a feud (ala Edgar Bergen and McCarthy's with W.C. Fields) was created in 1936. It lasted on the air for years, to the amusement of all concerned. 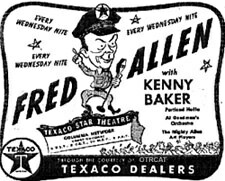 Sadly, a feud with his network brought the network censor into another feud, but other radio stars such as Red Skelton and Benny's pal Dennis Day, who got his own show too, took up for Allen by cracking jokes about the whole thing. Jack Benny and Fred Allen's infamous on-air feud began with Fred's ad-libbed comment that a visiting child violinist should put Jack's violin playing to shame. Writers from both programs met to plot out the feud much to the amusement of radio audiences and fans of both programs. 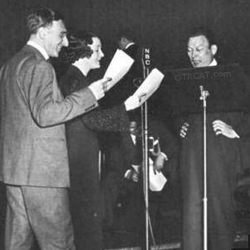 Allen's prime seasons of 1945-48 are great satirical radio, loaded with topical laughs, musical parodies and great characters that are timeless in their inventiveness and audience appeal. Allen was famous for ad-lib bing and cracking up the audience with running comments on the jokes and the show itself, as he had come up from Vaudeville and Broadway. 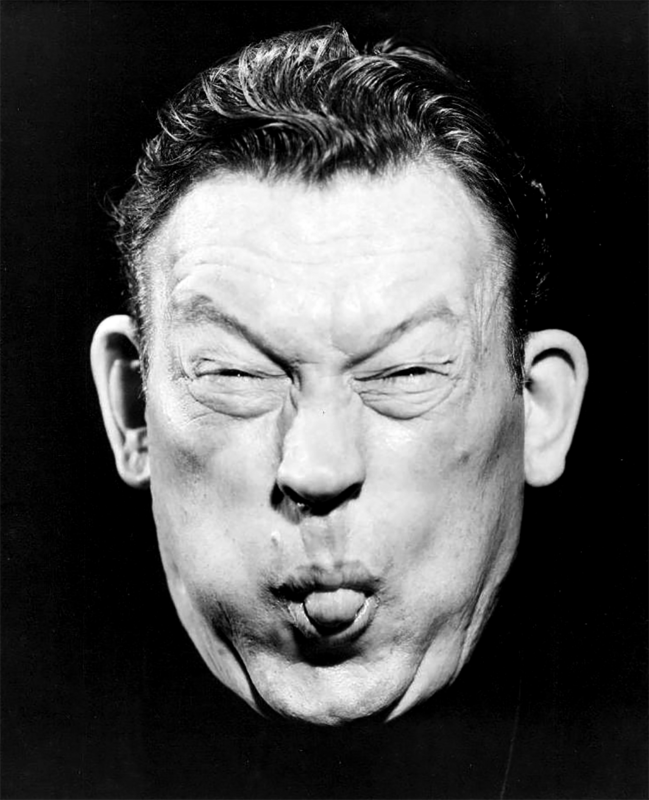 After WWII, the Fred Allen show seemed somewhat dated, as the temper of the nation was ready for a new thing. In 1948 Allen's Alley (an urban concept, really) was heard no more on network radio. An era had passed, as America moved to the suburban 1950s. Despite radio and TV appearances, Fred slowly stepped aside for younger, brasher comedy, and the continued success of family-driven situations on radio and TV. Fred and Portland lived a long and happy life together, and we both known as sincerely appreciative and thoughtful to all their friends and show-biz buddies. This great collection also includes a treasure trove of interview material, excerpts from guest-spots and Fred Allen highlights and sidelights. This set is a fine overview of the singular wit and wisdom of one of the most intelligent of America's topical humorists, Mr. Fred Allen. 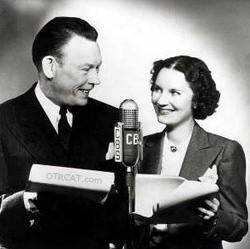 The other day I mentioned Fred Allen because I hadn't seen his name come up in conversation here and hadn't heard many of his programs on OTR programs. I was afraid he was maybe largely forgotten by the devotees of OTR today. Imagine my surprise and delight to see so many people love and revere Allen today. He seems to be held in affection by a large number of people. Some people have come to him through his books, and others through his programs and still others by way of his "What's My Line" stint. It just confirms my belief that OTR fans are descerning. 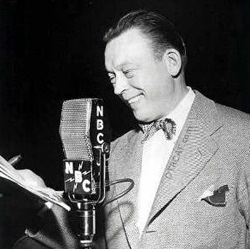 He is mentioned often in the Jack Benny due to their "feud"
Fred Allen once made the comment that the reason radio is called a medium is because "nothing is well done." Fred is one of so many OTR performers we remember fondly but seldom discuss. When Jack Benny was appointed chairman of The March Of Dimes Fred's comment was: "The dime hasn't been minted that can march past Benny." Wise cracks were his speciality. I WANT to love this show, I really do! But it just never gets me. Now, Fred on WHAT\'S MY LINE?, is a real treat. If only he hadn\'t died, I think a good TV career was his. Well, I DO love the show!! I would have listened to it for the Sen Claghorn segment alone. I thought the show where Jack Benny won King For A Day was one of the highlights of Radio Comedy. It was fun when Phil Harris guested on Fred\'s show, and Fred tried to lure him away from Jack. Though I did have to suspend my disbelief that Phil didn\'t know what violins were. After all, Jack had played one many times. Jb370314 Fred Is The Guest. The Feud Continues.